Added attack/recovery/reload timers to the tooltip in top-left corner. In some cases, the timer is red - for attack/cast it means that action can't be interrupted anymore, for recovery it means that recovery timer is paused (usually due to active CC, like paralysis). 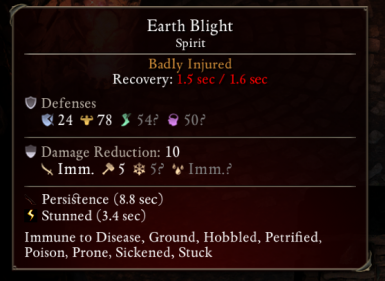 Added detailed breakdown of the accuracy, defense, damage, damage resistance and damage resistance bypass to the tooltip shown when hovering over combat log message. Unfortunately, I couldn't create a timer for casts. The reason for that is that both casts and attacks are actually animation-driven; while animations for attacks are simple (single clip of a well-known duration), this is not the case for casts - they usually have complicated animations with transitions. Unfortunately, Unity (at least of the version used by PoE) provides extremely limited scripting API to inspect animations (neither state transitions nor events can be queried). Note that this design of animation-driven cast times has an interesting implication for the recovery time calculations. Usually recovery time is proportional to attack time. For spells, it is actually proportional to the duration of the first piece of cast animation. This can easily be seen by e.g. looking at how cipher's Mental Binding works: it has relatively long cast time, but extremely short (~0.2 sec) recovery time - this is because actual casting animation consists of a short "introduction" clip followed by long "casting" clip. I'm not sure whether this is a bug or an intended effect.